It's not uncommon for FDA-regulated manufacturers to find themselves without the resources or processes to efficiently manage product complaints. When the resulting backlog isn’t cleared quickly and completely, the issue can compound into serious safety and compliance problems. 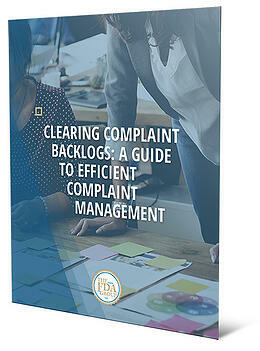 This guide dives deep into the common causes for complaint backlogs and offers adaptable, generalized strategies for remediation. These scenarios and solutions were compiled by Alan Greathouse, a regulatory compliance expert with extensive experience in identifying the causes of complaint backlogs and working to develop efficient and effective ways to remediate them in companies large and small, all over the world.